The impeccable perfect fit of innovative design and price, multi-mode lighting effect, remote control, long life-span, replaceable battery, simple installation, and low maintenance cost. We've solved all your problems for you, and it's your best bet to click on "BUY NOW" immediately. ※ Recommended to use a rechargeable AA battery to save more energy, longer battery life and more environmental friendly. ※ Please pull out the plastic sheet on the remote at first use. ※ The line is parallel, can be cut off more than the part, to achieve the appropriate length of the installation, without affecting the use of the lamp, but can not reduce the main line, otherwise it will cause damage to the product. ※ This products is not a toy, please keep away from children under 3 years old. ※ For long time no use, please take out the batteries. ※ Keep away from fire and open flames. 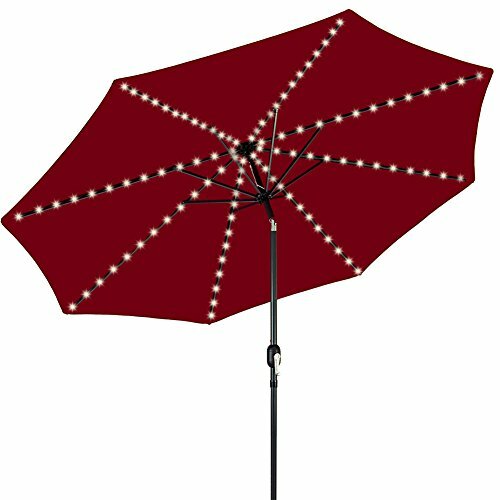 PERFECT DECORATION: If you want to add a touch of warm light and atmosphere to your next outdoor party, this patio umbrella string lights is a perfect solution for you. It has built-in 8 lighting modes and 10 brightness adjustment, suitable for various scenes. CREATIVE DESIGN: 8X13LED, each branch light length is 130CM. In addition, each LED light bead is in parallel, so it can be cut at will according to the size of the umbrella. You can complete the installation by simply wrapping the lamp strips around the umbrella rib, which is suitable for the general style and cantilever type of umbrella. REMOTE CONTROL: In order to control the light more conveniently, we have equipped with wireless remote control. The remote control has a variety of practical functions, such as light effect switching, brightness adjustment, circulation switch, and etc., to further optimize your user experience. WATERPROOF: We have waterproof the battery box and light strips, and the waterproof level of the battery box reaches IP65. In daily use, there will be no water enter into the battery box and thus no maintenance cost. 100% SATISFACTION GUARANTEE And Tips: our worry-free 12-month warranty and friendly customer service, If for any reason you're not 100% SATISFIED, please let us know and our customer service team will help you，Rechargeable Batteries are Recommended For Long-Term Use.Its Light is Soft And Suitable For Decorate Patio Umbrellas. If you have any questions about this product by TTKTK, contact us by completing and submitting the form below. If you are looking for a specif part number, please include it with your message.